Semana Santa is a very important time in many Hispanic countries including Spain. 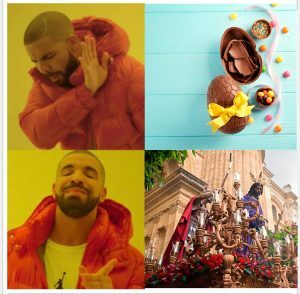 During this time, which coincides with traditional Easter in other countries, strange but deeply rooted traditions are taking place in these countries. 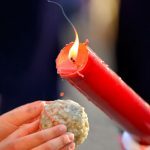 Today in OnSpain School we want to bring you a little closer to these traditions. In order to do this we are going to show you some vocabulary in Spanish associated with Easter. Semana Santa is a week when we remember the final days of Jesus of Nazareth in Jerusalem. Therefore these are Catholic holidays that are firmly rooted in Spain and Latin America. Of course the non-Catholics can also enjoy this time by going on holiday or just relaxing because no one works during Semana Santa. 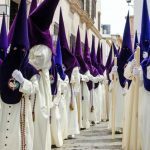 What are the processions of Semana Santa? The processions of the Semana Santa are the most characteristic part of this period in Spain. A procession is a religious parade in which sculptures of Jesus Christ and the Virgin Mary are taken out of the churches. These images are called ‘pasos’ o ‘tronos’( in case of Málaga). The ‘pasos’ o ‘tronos’ are carried through the streets on the shoulders of the porteadores or costaleros and accompanied by Nazarenes or penitents. These are people who are dressed in a similar way, mostly with an elaborate tunic and characteristic pointed caps, the so-called Capirotes. They are (usually) accompanied by a band with cornets, trumpets and drums. 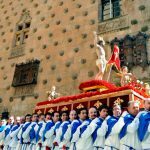 As the name suggests, ‘Semana Santa’ lasts for seven days although there are some events and processions which take place a few days before. Although there are processions and liturgical events every day, the most important ones are Holy Thursday, Good Friday and Holy Saturday. As you know, the days of the week are usually written in lower-case letters in Spanish. However, an exception must be made here, as they are considered festivities (such as Christmas or Carnival) and must always be written in capital letters. Málaga is a special place to enjoy the Holy Week and a great place to put this unusual vocabulary into practice. In the city, you can find dozens of processions, in the streets accompanied by hundreds (or thousands!) of people. Whether you are a Catholic or not, you will probably enjoy this popular religious and artistic event. Many of the images of Jesus Christ and the Virgin Mary are sculptures created centuries ago and are even considered artistic heritage. During Holy Week in Málaga there are many processions but the most important and most spectacular are the Cautivo (the captivity), the most revered image, the Virgen de las Penas (Virgin of sorrows), whose mantle consists of thousands of fresh flowers or the Virgen de la Esperanza (Virgin of hope), whose ‘paso’ is carried by more than 200 men. Of course you can’t miss the transfer of the Cristo de la Buena Muerte (Christ of good death) by the legion, an elite corps of the Spanish army.